By the time she was of retirement age, my mom had risen to the position of Vice President of my northern New Jersey hometown’s one and only bank. She was a banker by day but an artist on her own time. She loved her evening art classes, where, she told me repeatedly, she would “completely lose track of time.” Always a big believer in my hidden abilities, she encouraged me to take art classes too. “You’d be so good at it, Bon!” she enthused. I nodded, then added “Take painting classes” at the bottom of my then-long bucket list. “Some day, Mom,” I assured her. I was too busy. She got to be really good. At her memorial service, where there was standing room only in the large hall because everyone in town banked at the local bank and appreciated her indefatigable help, my sisters and I put her many paintings on easels and positioned them around the room — the first and only show of her artwork. I sometimes think if she had been an attendee at this memorable event, instead of the person being eulogized, she would have been impressed by all the beautiful oil paintings on display. That was more than thirty years ago. Over those years, of course, my long bucket list has gotten shorter and shorter. You might say I’ve been busy putting the finishing touches on it lately. This year I reached the “Take painting classes” entry and was able to check that one off at last. 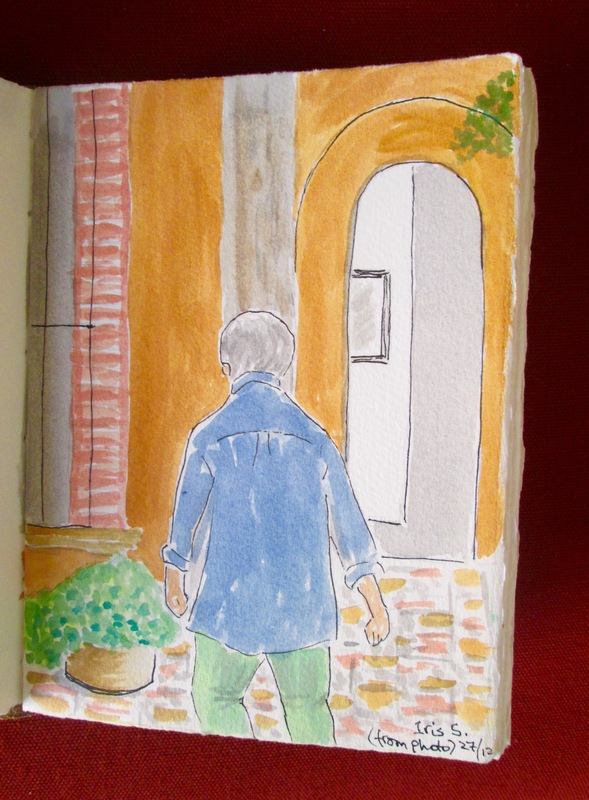 In October I took a three-day watercolor workshop here in San Miguel de Allende, Mexico, with a superb art teacher, Donna Dickson. I learned things. I now have a handle on the step-by-step of it. But only my mother (who was, frankly, biased) could say I’m any good. My efforts have an “undercooked,” unfinished quality about them. They look like first drafts. “And when, exactly, is that?” my students would ask. What I know now is that, like beginning writers, I need more patience and stick-to-it-iveness for my watercolor painting. I need hours and hours of practice (or, roughly, 10,000 hours, according to Malcolm Gladwell’s theory of mastery in his book Outliers). I should stop putting my brush down – as I’ve been doing so far – too soon. I’m pretty good at finding a paintable scene and taking a photo of it for future copying. (In this beautiful old colonial city in the central mountains of Mexico one would have to be seriously visually impaired NOT to find countless paintable scenes on every daily walk.) 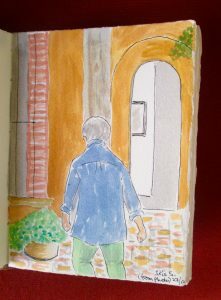 I can sketch that scene in pencil on my watercolor paper, and mix the paints to resemble the true, vibrant colors here. I can make my painting into a pale, rough copy of the original scene. But that’s where it ends. I let it dry as I walk away. When I look at it again later, I see a childlike effort, dull and flat, devoid of texture, nuance, contrast. Clearly, I need to learn how to apply the finishing touches – the darkness and shadows that will allow the lighter colors to pop. And clearly, to me, when I dig deeper into myself, I find a fundamental fear of shadowy darkness. I’m afraid the gray-black paint will bleed into the rest and turn my pretty picture muddy. I’d prefer my paintings (and all of life?) to be all bright colors and glowing light. I know I must strive in the New Year ahead to embrace contrasts and not be afraid of the dark. Still so much to learn. Feliz año nuevo a todos. Happy 2017 to all.